Basketball can be easily described in the incredible work on Bill Bradley and his rotund success in literature when he finally wrote “Life on the Run” that captures basketball in a beautiful yet, intelligent way. Life on the Run gives us the complete picture of what is the life of a pro player in basketball. And while this idea can sound like a funny and happy story, the reality is far more bitter and dark that you might think of thanks to the incredible writing skills that Bill Bradley uses to describe almost every aspect of the life of these pro players. While most of the book gives us the classic and never-ending story of the beginnings of the most famous stars in basketball, Life on the Run changes drastically with every page, giving us the moments of happiness and joy in each victory and the dark tones that can be meant to be basketball superstars. These dark moments can shine through the book while we read about the loneliness that a basketball star suffers when he’s in a cheap motel room waiting for the next game to come or the tedious sessions with the media and the details that he has to offer about his life. Since Life on the Run is focused on giving us the whole story of basketball and the details that these players do in their life. It often captures the feeling of emptiness that these starts can really suffer in their lives. While other aspects in their life that are often unspoken for the fans or the media. Stress and pressure are one of the most common symptoms in the average life of each pro player, and while they are often rewarded for their effort playing in the big leagues. It still needs a proper explanation, and this is where Life on the Run really shines, as well with his content in the state of basketball. Since Basketball is not only the sport, is the culture that follows this passion and the movement that they can cause among all the fans that are driven by professional basketball. For that Life on the run gives us a great explanation in this culture and relies upon us a lot of moments to think about the difficult life that is behind every professional sport. 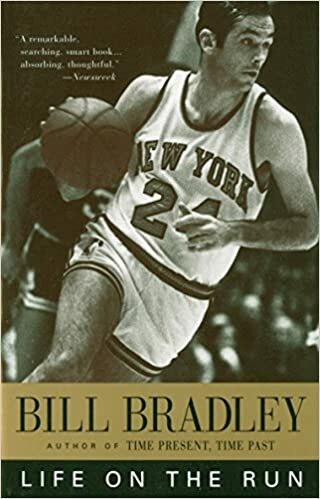 With that in mind, Life on the Run by Bill Bradley is a must-read if you are a fanatic of basketball and want to explore more about the lives of the average player, as well on how the match is illustrated and described in this amazing book.